Gareth Curtis is mobbed by teammates after scoring Sherwood Colliery's second goal against Selston. 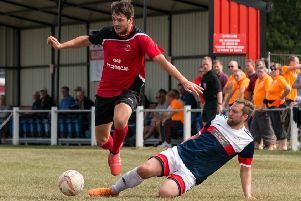 Jubilant Sherwood Colliery brought to end the excellent 18-match unbeaten start to the season by leaders Selston in the East Midlands Counties League, Premier Division. Second-half goals from Kieran Wells and Gareth Curtis earned third-placed Sherwood a 2-0 win that lifted them to within seven points of their rivals with a game in hand. But their main hero was goalkeeper Joe McCormack, who saved a 25th minute penalty, taken by Ben Moore just as Selston were getting on top. Two further efforts saw the woodwork come to Sherwood’s rescue as the first period ended goalless. In the second half, the hosts always looked menacing on the counter attack and, in the 57th minute, Wells snapped up the rebound after Lewis Weaver’s fierce 25-yard effort had been parried by goalkeeper Alfie Smith-Eccles. Wells went close again before, 11 minutes later, another rapid break led to Curtis doubling the lead by calmly finishing a one-on-one.